Available Light Theatre will perform ‘How We Got On’ on Saturday, Jan. 20 at Ohio Wesleyan University. The Idris Goodwin play features, from left, Treasure Davidson, David Glover, Rudy Frias, and Wilma Hatton. Showtime is 8 p.m. at the Chappelear Drama Center, 45 Rowland Ave., Delaware. Hank studies hip-hop as intently as his father wishes he studied algebra, longing to create music of his own. 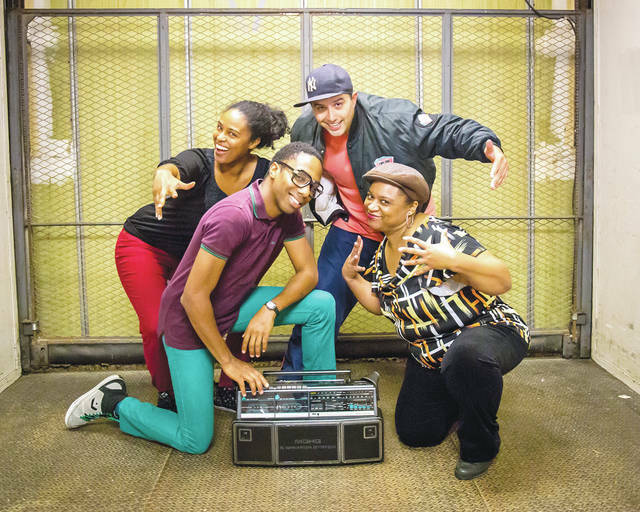 He teams up with Julian and Luann in the inspired and inspiring play, “How We Got On,” a 1980s coming-of-age story about chasing dreams. Columbus-based Available Light Theatre will present one performance of Idris Goodwin’s “How We Got On” at 8 p.m. Jan. 20 on the Main Stage of Ohio Wesleyan University’s Chappelear Drama Center, 45 Rowland Ave., Delaware. Tickets are reservable now. Directed by Drew Eberly, “How We Got On” features actors David Glover (Hank), Rudy Frias (Julian), and Treasure Davidson (Luann) with narration by Wilma Hatton (The Selector), an onstage DJ who spins records and supplements Goodwin’s award-winning story with extra characters and insider information about hip-hop culture. Playwright Goodwin is an assistant professor in The Department of Theatre and Dance at Colorado College and also is an accomplished poet, performer, and essayist. His work has been featured on HBO, The Discovery Channel, National Public Radio, and “Sesame Street.” Learn more about him at www.idrisgoodwin.com. Available Light Theatre is “a fellowship of artists dedicated to building a more conscious and compassionate world by creating joyful and profound theatre and serving our community.” With roots stretching back to 2002, AVLT was founded by Matt Slaybaugh in 2006. Learn more at http://avltheatre.com. Tickets for AVLT’s Ohio Wesleyan performance of “How We Got On” are $10 for general admission and $5 for senior citizens, Ohio Wesleyan employees, and non-OWU students. Admission is free for Ohio Wesleyan students with a valid OWU ID. To reserve tickets, call the OWU box office at 740-368-3855. For more information, visit www.owu.edu/TheatreAndDance.